The Isle of Skye is famous the world over for its dramatic volcanic landscapes and awe-inspiring seascapes. If it’s on your bucket list this summer, it’s definitely worth planning ahead to make sure that you make the most out of the time you have there. As we have been running Skye tours for nine years we have spent a lot of time looking into the transportation options to the island, particularly from Edinburgh, as this is most tourists’ gateway to Scotland. Here are our insights into how to get to Skye – hopefully this will help you to decide which suits you best. The nearest train station to Skye is in Kyle of Lochalsh, which is situated off the island, just before the Skye Bridge. To get there from Edinburgh you need to change trains at least once, in Inverness, and the quickest journey time is 6 ½ hours (although it can take up to eight hours if you don’t pick the right trains!). You can plan your journey at trainline.com. From Kyle of Lochalsh you would then need to take a tour (try Real Scottish Journeys, who offer private tours, or scheduled departures from Portree), take a taxi or rent a car (from Skye Car Hire and Kyle Taxi) to explore Skye. If you are taking this option we would recommend staying a night or two on the island, and definitely make sure you book this well in advance if you are travelling between April and October. You can hire a car in Edinburgh and drive up to Skye. To drive directly to Portree (the main village on the island) this would take over 5 hours. However, we would suggest allowing at least 7-8, particularly if you have not driven in Scotland before! The first hour of the drive from Edinburgh to Perth is absolutely fine as it is on dual-carriageway. You then have mainly single carriageway for 1 ½ hours. For the next 3+ hours you move on to typically Highland narrow, twisty roads which can be tricky to drive (albeit scenic! ), and very busy in summer. There are a few route options but here is a Google Map of the quickest one. If you are driving make sure you check Traffic Scotland regularly as road traffic accidents can close the A9 and diversions can add hours to the journey. This would be a good option if you are keen to see places en-route to Skye, as you have much more flexibility to stop where you wish. It may also be a good option if you have not booked accommodation on Skye, as it will be easier to find somewhere off the island. There are many companies offering tours from Edinburgh. 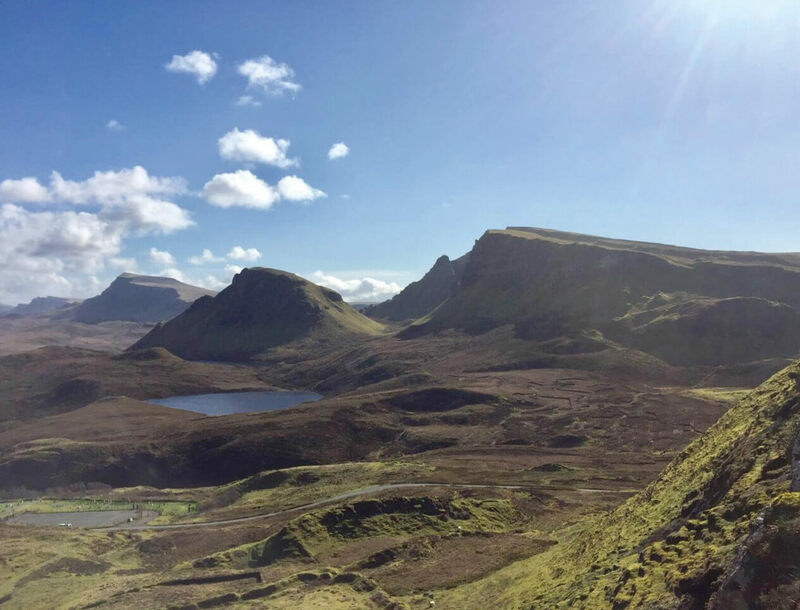 Due to the distances involved these are mostly three day tours i.e generally a day is spent travelling up, you stay on Skye, have a day sightseeing on the island then spend the third day travelling back to Edinburgh. Companies offering three day tours from Edinburgh include Haggis, Timberbush and Heart of Scotland. These can be a cost-effective way of travelling to Skye, they generally cover Loch Ness en-route too, and they will take care of your accommodation (which is important, as getting accommodation on Skye in summer is very tricky!). For those who want to see the highlights of Skye, but would also like a taste of the Highlands, there are a number of companies offering day tours from Inverness to Skye (including the highly rated WOW Scotland, don’t know if you’ve heard of them?!). You can take a direct train or bus from Edinburgh to Inverness, which takes around 3 ½ hours, and is very scenic. We would recommend doing this the night before the tour, then staying in Inverness overnight, taking the tour and return to Edinburgh the next day. Our tour is a bumper 12 hour day but you will see loads (the one day tours from Inverness generally cover the same sights on Skye as the three day tours from Edinburgh) and it is definitely worth it! You can get some great deals on the bus and train from Edinburgh to Inverness but you must book in advance for this (there are single advance fares on the train for as little as £12.10, or you can take the Megabus/CityLink for around £10 one way). We hope that this has been helpful, and we hope that you will get Skye ticked off your bucket list this year; it is definitely one of the highlights of Scotland!